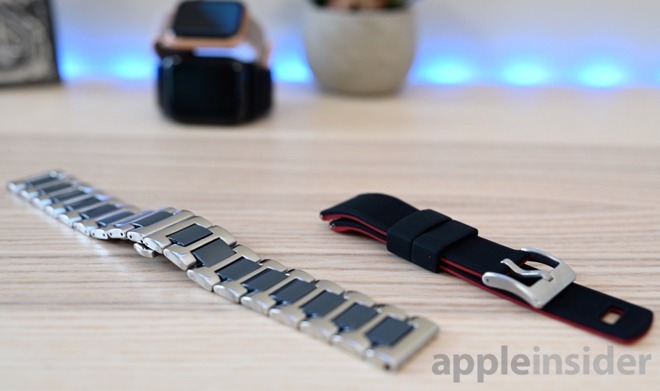 There are a lot of great Apple Watch bands out there. The problem is that some of the best aren't available for Apple Watch and others are marked up purely because they claim to be specifically for Apple Watch. Watches and watch bands were around before the Apple Watch and just the lugs should preclude a watch band form working with Apple's wearable. Luckily, it is dead simple to make your Apple Watch bands using off-the-shelf bands and a set of lugs. AppleInsider is going to go over everything you need, the different options available, and the process for putting it all together. There are two primary things you need to make an Apple Watch band. A traditional watch band and a set of lugs. Let's look at what you need in lugs first. For your lugs, there are many different styles out there. Some require tools to install, others do not. Some lugs are simple and mimic Apple's while others are more rugged looking and are styled after Nomad's iconic bands. Lugs also come in many different colors from gold, to silver, to black. When choosing, make sure not only to get the size you need but the color as well. Now let's dig into the bands. 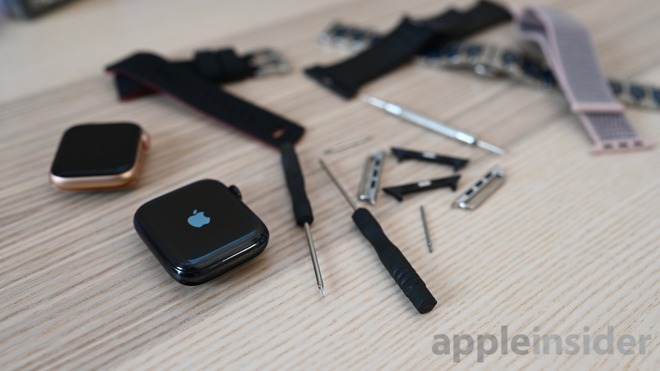 A band should come without any sort of lugs, as is normal for a non-Apple Watch. There are some bands out there that are tapered or angled to fit certain models of watches. When searching, be on the lookout for ones with flat ends and just a hole for the lugs to attach to. The watch band also must fit the lugs that you've chosen. That means the width of the band must be the same width as the opening in the lugs. Only measuring will give you a concrete answer to the watch band size you need, though most lugs will tell you what size is required in the description before you buy them. As a rule, the 42/44mm rugged lugs fit a 22mm width band. The simple lugs will fit a 24mm band on the 42/44mm and 22mm bands on the 38/40mm lugs. 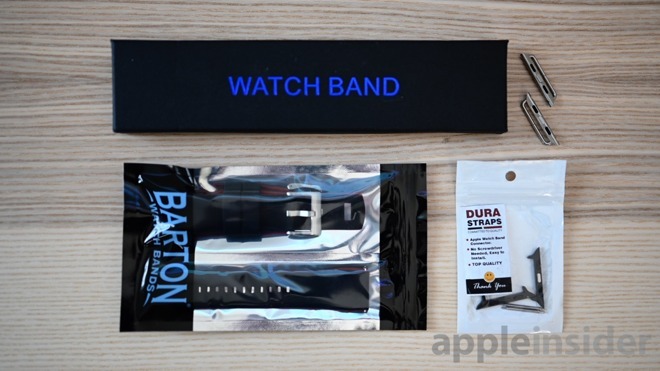 In our above video, we used Dura Strap lugs for a 44mm Apple Watch Series 4 and a 22mm silicone band from Barton and a 22mm stainless/ceramic band from Sinaike -- all of which we'd recommend. Note: In rare situations, the pin may not fit the opening of the watch band. Depending on your lug style, you may be able to get replacement pins that will fit or you will have to choose a different lug/band. Now we've got our lugs and band picked out, it is time to assemble. If you went with the rugged-style lugs, there are no tools necessary. Simply insert the pogo pin into the end of the watch band, place one end of the pin into the side of the lug, press down on the other side while inserting it into the other inner-side of the lug. This is a bit knacky and is easier to do with fingernails. Alternatively, a common watch tool or mini flat head screwdriver may help. The simple-style lugs will require a mini screwdriver, often which is included. 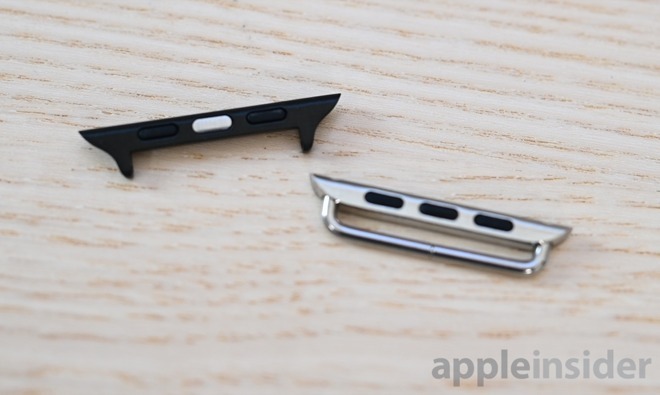 One of the screws is removed, which allows the bar to come apart in the center. 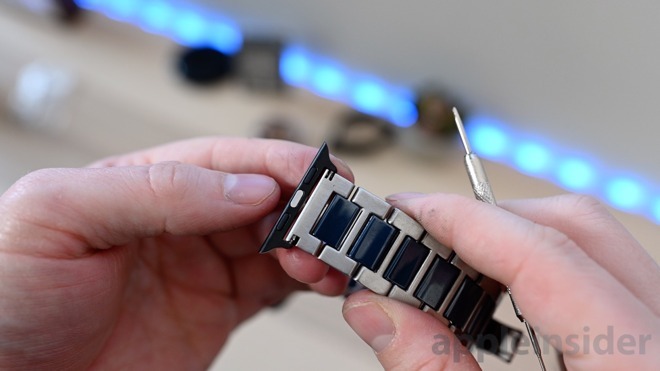 Slide the watch band over the remaining half of the bar, insert the other half back, then put the screw back into place. Be sure that the screws are tightened securely. If it should come loose, your band could fall off that side. By putting the band together yourself, you have so many more options opened up to you. 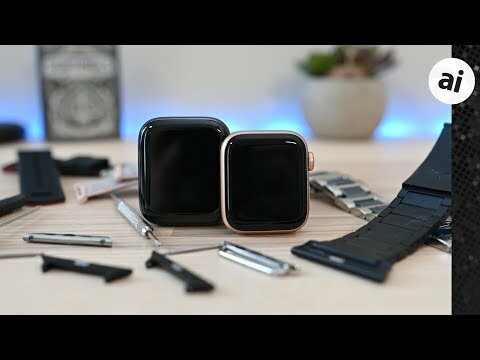 Your watch can now represent you and your style without being limited by the Apple Watch market or the steep markups we see for the best bands. Dura Strap lugs were sold out when we put together this tutorial, but there are countless others available to choose from that are near all interchangeable. We chose some of our favorites that we featured above because of the design and the many options that they had available. The Barton silicone strap has a subtle two-tone design and a locking system to prevent it from coming open during a workout. 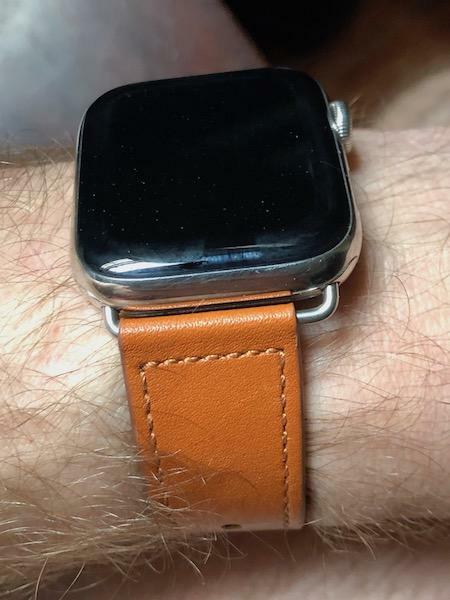 Both ends of the strap are also tapered down to fit the curvature of our wrist making it extra comfortable and unlike any other silicone Apple Watch band we've tried. A built-in tool also makes it effortless to take on and off the lugs. The metal band is particularly nice on the stainless steel Apple Watch. It has quite a bit of heft due to the steel makeup. The ceramic links in the center are also available in many different colors. In the box, we also got tools, several extra pogo pins, and a link removal tool. Best of all, both bands were extremely affordable. If you make your own band, give us a shoutout on Twitter so we can see what you come up with @AppleInsider. I've put straps and lugs together to make bands. It's pretty straight-forwarding, assuming you have the eyes and hands for it. My only observation has been that the oft-recommended 22mm strap width is too narrow for the lugs I've received. 24mm would fit better (my lugs are 1" between the bends, or 25mm).